It’s a longstanding question that has many different answers, depending on who you ask. But, as Visual Capitalist's Jeff Desjardins notes, today’s chart approaches this fundamental question from a data-driven perspective, and it provides one potential solution: money does buy some happiness, but only to a limited extent. Let’s say you have two hypothetical people: one of them is named Beff Jezos and he’s a billionaire, and the other is named Jill Smith and she has a more average net worth. Who do you think would be happiest if their wealth was instantly doubled? Beff might be happy that he’s got more in the bank, but materially his life is unlikely to change much – after all, he’s a billionaire. On the flipside, Jill also has more in the bank and is likely able to use those additional resources to provide better opportunities for her family, get out of debt, or improve her work-life balance. Just like these hypotheticals, the data tells a similar story when we look at countries. Today’s chart looks at the relationship between GDP per capita (PPP) and the self-reported levels of happiness of each country. Sources for data are the World Bank and the World Happiness Report 2017. In general, this means that as a country’s wealth increases from $10k to $20k per person, it will likely slide up the happiness scale as well. For a double from $30k to $60k, the relationship still holds – but it tends to have far more variance. This variance is where things get interesting. 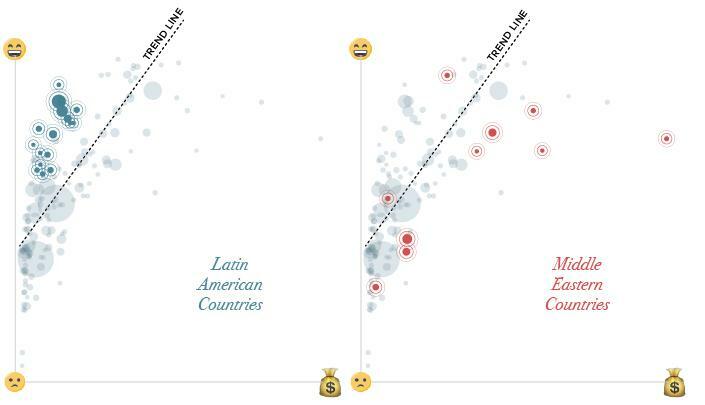 In Latin America, people self-report that they are more satisfied than the trend between money and happiness would predict. Costa Rica stands out in particular here, with a GDP per capita of $15,400 and a 7.14 rating on the Cantril Ladder (which is a measure of happiness). Whether it’s the country’s rugged coastlines or the local culture that does the trick, Costa Rica has higher happiness ratings than the U.S., Belgium, or Germany – all countries with far higher levels of wealth. In the Middle East, the situation is mostly reversed. Countries like Saudi Arabia, Qatar, Iran, Iraq, Yemen, Turkey, and the U.A.E. are all on the other side of the trend line. Within regions, there is even plenty of variance. We just mentioned the Middle East as a place where the wealth-happiness continuum doesn’t seem to hold up as well as it does in other places in the world. Interestingly, in Qatar, which is actually the wealthiest country in the world on a per capita basis ($127k), things are even more out of whack. Qatar only scores a 6.37 on the Cantril Ladder, making it a big exception even within the context of the already-outlying Middle East. Nearby Saudi Arabia, U.A.E., and Oman are all poorer than Qatar per capita, yet they are happier places. Oman rates a 6.85 on the satisfaction scale, with less than one-third the wealth per capita of Qatar. There are other outlier jurisdictions on the list as well: Thailand, Uzbekistan, and Pakistan are all significantly happier than the trend line (or their regional location) would project. Meanwhile, places like Hong Kong, Ireland, Singapore, and Luxembourg are less happy than wealth would predict.